The latest Irish bar to open in Prague, McCarthy's feels like it has been here for years; it has the aged Irish pub feel and already draws more punters than long established bars elsewhere in the city. McCarthy's enjoys an ideal central Prague location between the Old Town Square and Wenceslas Square, just two minutes walk from both. 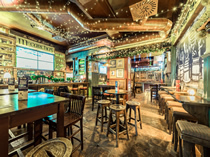 As most overseas Irish pubs tend to, McCarthy's offers an alluring mix of satisfying drinks, lively atmosphere and big screen coverage of top sports. But for good measure it also houses a disco in the basement which pumps out the tunes until the early hours. Starting upstairs, the bar has an authentic Irish feel. All the wood used to construct and decorate the pub was shipped in from Ireland, along with the old bottles, pictures and other Irish memorabilia. And the pub is run by an Irishmen. The result is a warm and friendly pub with plenty of ambience. The bar has a number of large screens which show an extensive programme of sporting events, including live Premier league, Champions League and World Cup football, rugby and cricket, Ice hockey matches, and American sports. There are Czech beers on tap, Strongbow cider and cool Guinness, plus a range of wines, spirits and cocktails to choose from. Prices are a little on the high side for Prague, but you are paying for the atmosphere and location. In the warmer months a terrace outside provides a pleasant place to sit and watch the world go by. Downstairs in the disco, the night kicks off with live music every evening, followed by a DJ playing pop and party music until the early hours. At weekends the dance floor can get pretty busy. McCarthy's is a good all round venue which attracts a wide range of people, from couples and expats to groups of hen parties and stag dos. And the latter can get a full Irish Breakfast all day long, if you are in need of revitalisation.